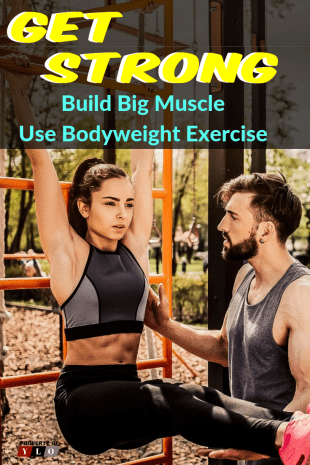 Full Body workout routine for big muscles using bodyweight exercise. Muscle workouts at home, when you first wake, just before bed, or while the kids are down for a nap. If you are given a chance to learn something new that doesn’t cost a thing, that would help you sleep better, boost your metabolism and mood, would you consider trying it? If yes, then you should be able to start bodyweight fitness for your muscle workouts. Regardless of the fact that a lot of people are now aware of the benefits of bodyweight exercise, they still do not try to do it. Medical professionals have continuously advised people to use the bodyweight exercise to build their strength. Studies have shown that in every decade, Americans lose more than six pounds of muscle. Also in every decade, people from age 20 years and above experience a 3-8% decrease in their metabolism. In order to slow the rate at which your body’s metabolism reduces and to avoid gaining unnecessary weight, you should do regular bodybuilding exercises. These exercises help to strengthen your muscle workouts and give you the ability to lift things that are heavy. By lifting heavy weight, it makes your body strong and makes big muscles. It is easy to build your strength with your own body weight. You can do bodyweight exercise anywhere you are. Bodyweight exercise does not make use of any equipment and it does not require you to have a membership at the gym. The exercise can be done within 30 minutes. Why Do You Need Bodyweight Exercises? Bodyweight exercise is as important as every other type of exercise. The major benefit of bodyweight exercise is that as you age, it would help to build big muscles. The exercise also helps the heart function properly and eases blood circulation. It assists the brain to function properly. • Reduce the risk of having illnesses and diseases like stroke, cardiovascular diseases, and acute coronary syndrome. Also, bodyweight exercise is important because it helps to eliminate the effects of chronic dieting. Even though dieting is essential in helping to lose weight, it also comes with some adverse effects. After some years of dieting, a person has a chance of losing muscle tissue. Losing muscle tissue can come as a result of staying on a low-calorie diet or from aging. If you want to retain a healthy weight you must use muscle workouts to build big muscles. How Much Bodyweight Exercise Do You Need Every Week? Bodyweight exercise should be done two to three times weekly. The exercises should encompass a full body workout routine that involves the use of the muscle workouts focusing on your chest, back, core and legs. You should do 10 different exercise techniques for each exercise session. Each technique should be targeted at a particular muscle and should be repeated 12 times. In addition to the bodyweight exercise, you should also manage to do stretching exercises for three days a week. It doesn’t matter if you are trying to lose weight or gain weight. The most important thing about bodyweight exercise is that it helps you achieve body fitness. These are some of the benefits of keeping fit with bodyweight exercise to get both mentally and physically healthy. Bodyweight exercise helps to improve body metabolism and as such, it assists the body in increasing lean muscle mass. The lean muscle mass of the body reduces as we age. The body needs lean big muscles to maintain a healthy weight and to keep a functional body metabolism. Muscle workouts help create muscle mass which also helps with other body functions like the thyroid functions, insulin sensitivity, and the hormonal balance. When you have leaner big muscles, the more your metabolism rate is increased. This means that you would need to add more calories to keep your body weight. If you have observed athletes, you would see that they eat whatever they want. Aside from the fact that they train using muscle workouts for several hours every day, their big muscles burn up a lot of calories and fat. By building big muscles, your body loses fat. Also, your hormones increase when you do bodyweight exercise. Hormonal development helps the body to retain lean and big muscles and assists in burning fat. If you are involved in cardio exercises like running or swimming you should add bodyweight exercise to your routine. Adding bodyweight exercise to your routine will strengthen your back for running and your shoulders for swimming. Generally, exercise helps the circulation of blood throughout the body. It helps to reduce the risk of having high blood pressure. During muscle workouts, bodyweight exercise adds strength to the heart as it does to the other muscles. It helps the heart to function properly. These exercises also improve blood cholesterol levels and as such people have a lower risk of developing cardiovascular diseases. Body weight exercise helps you to achieve positivity. It is recommended for people who are recovering from heart diseases. Studies have shown that regular exercises are one of the natural cure for diabetes. Exercises reduce the presence of glucose in the body. It converts the glucose to glycogen which is then converted to energy. Body weight exercises prevent the body from storing up glycation waste products in the bloodstream. These end product cause damages in the blood vessels and internal organs. Another benefit of bodyweight exercise is that it helps to eliminate depression. Just like regular exercises, it reduces the body’s stress levels and enhances your physical health. Exercise plays a major role in enabling us to get better sleep and in boosting our self-confidence. The chemicals released during exercise cause your mood to be lifted and increase your energy levels. Body weight exercises help to lengthen a person’s lifespan. It works to improve the DNA which damages as a result of the aging process. When a person exercises, the BDNF hormone is released into the body. This hormone is responsible for reducing stress levels and also for cellular regeneration. These exercises also reduce the risk of a person getting diseases like dementia, Alzheimer’s diseases, and other cognitive diseases. When you increase your muscle mass with these muscle workout exercises, it helps protect the joints and bones in the body. By developing stronger muscles, your body doesn’t need to rely solely on your joints for movement. Bodyweight exercise reduces the presence of body pain, especially in the back, hips, knees, and ankles. With these exercises, the bone is fortified to protect the skeletal frame. It would prevent you from developing bone problems that can cause you to fall or easily get fractures. How Do You Start Doing Bodyweight Exercise? To get started with bodyweight exercise, you can start by simply doing exercises like push-ups and squats to build up strength. Start gradually and do the exercises within the time limit of your capacity. You can make a custom workout program that involves 5 to 10 bodyweight exercise techniques. It is advisable to do these exercises one after the other to achieve better results. To get the benefit of these exercises, don’t take any rest in-between so that your heart rate can stay increased. After the 5 to 10 exercise techniques are completed, you should repeat another round if you have the strength to do it. You can repeat the sessions at least three to four times every week while using the resting days to do cardio exercises. How many rounds of bodyweight exercise should you do for each session? When doing exercises, you should start with what feels comfortable for you. Do not exceed your body limit. It is important to pay attention to your body especially during muscle workouts. The amount of exercise your body can take depends on your current body fitness. For a start, you can aim for rounds between 12-20. When doing bodyweight exercises, start with light loads and at a slow speed. With time and consistency, you can increase the level of difficulty. After the exercise, it is normal to feel tired. It is wrong, however, when you begin to notice the pain. Although cardio exercise is good for the body, bodyweight exercise is much better. They have a long-term effect of strengthening the body. Bodyweight exercise is safe and can be done anywhere. It is also very affordable and considered as an inexpensive full body workout routine. • The muscle workout exercises not only strengthen the muscles but also helps in burning fat. • People prefer to do bodyweight exercises especially for those that can’t afford the expense of going to gyms. • Bodyweight exercises are not only affordable but are essential for general body health. • It is recommended for people with heart diseases. • It is also used to prevent the risk of developing heart problems like high blood pressure. • People who are engaged in bodyweight exercises have a lower risk of having diabetes. • The exercises help to improve a person’s mood and reduce the presence of depression. • It lifts your mood and aids the circulation of blood in the body. • These exercises improve the mind’s cognitive functions and increase the body’s metabolism. • The hormone released during the exercise helps to improve brain functions and helps the cells to regenerate. • It improves your confidence and self-esteem. • You will notice a general well-being as you continue exercises. • These exercise help to burn fat. • You will notice an improvement in your sleeping habits and it would reduce the amount of stress in your body.